Phragmipediums are new world ladyslippers that grow from Mexico through the central and northern parts of South America. They can be found growing on rock outcroppings (Mexipedium xerophyticum), in forks of trees (caudatum), or volcanic clay (boisserianum and wallisii). Some plants such as longifolium, ecuadorense, pearcei, or klotzscheanum grow submerged underwater through periods of heavy rainfall. The flowering season is heaviest in the spring. However many species can bloom for 6-11 months at a time, often one flower consecutively after another. The flower colors vary from green to mahogany-pink and the brightly fluorescent orange of Phragmipedium besseae, which was recently discovered in 1981. Since then, the Phragmipedium has been used to create several hybrids of amazing colors and shapes. Without a doubt, this genus of orchid produces some of the most eye popping flowers in the market. Phrags like clean water such as rain water, distilled, or reverse osmosis (R.O.) system water. Almost all of the Phrags in nature grow slightly on the acid side with a pH ranging from 5.5 and lower. Municipal well water usually has limestone added to prevent pipeline corrosion. If the pH of the city water is 7.5 or lower, the following Phrags will do O.K. potted in bark/peat mix: Phrag. caudatum, wallisii, lindenii, pearcei, Mexipedium xerophyticum, longifolium ecuadorense and amazonicum. Phrag. boisserianum and besseae require clean water to do best. Water should be applied copiously as the plant approaches dryness. Do not let these plants become totally dry at the roots between watering! If in doubt: water. Plants which like somewhat drier conditions at the roots include caudatum, lindenii, wallisii, and Mexipedium xerophyticum. For tap or well water, use GrowMore Urea Free 20-10-20 at the rate of 1/2 tsp. per gallon when using municipal water (well water), rain water, distilled, or R.O. water. When using rain, distilled or R.O. water, add back in 5-10% of your hard water to provide calcium and magnesium. Feed more heavily in spring and summer, less in fall and winter. Feed every second or third watering in summer at full strength and every fourth or fifth during the winter months. 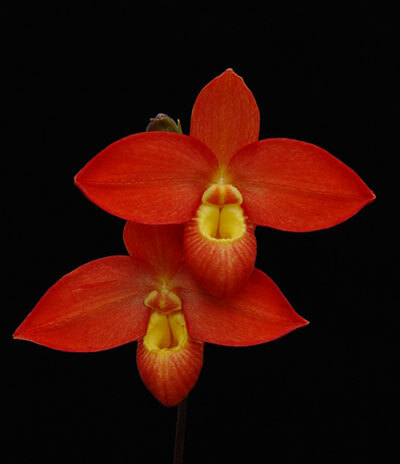 Most Phrags require more light than Phalaenopsis or Paphiopedilums (2400 to 3000 foot-candles). However, plants like besseae, pearcei and ecuadorense will do well in diminished light. Some Phrags like caudatum can take stronger light as for Cattleyas. East or south window exposures work best. L.E.D. Grow Lights are an excellent artificial light source for Phragmipedilums. Phrags generally require intermediate temperatures with days in the 70's or 80's (degrees Fahrenheit) and nights in the upper 50's to low 60's. Some Phrags like longifolium, sargentianum, pearcei, ecuadorense and hirtzii will tolerate slightly warmer temperatures. One problem that seems to occur during the summer is a soft, brown bacterial rot that appears at the base of the leaves. When you see this, carefully pull these infected leaves off and treat the plant with a bactericide such as Phyton-27 or Agri-Strep or streptomycin. Grow in 50% to 70% humidity. Some phrags, like caudatum, can take humidity down to 35% in nature during the dry season, but the roots are always moist and the nighttime humidity is high. We offer the humidity tray and an ultra sonic fogger to help increase humidity. The flowering seasons are various but the best flowers are produced during the spring season. Phrags can bloom wonderful colored flowers that can continue to bloom for several months. It is very common for Phrags to drop their flowers within one week of opening. Do not remove the flower spike as it will produce another bud and continue to flower. Once the flower spike has finished, it will eventually turn brown. If the plants are not flowering for you, they either are not big enough to bloom or they are not receiving enough light cool temperature at night to initiate blooming. Clean water is also very critical in producing good blooms.